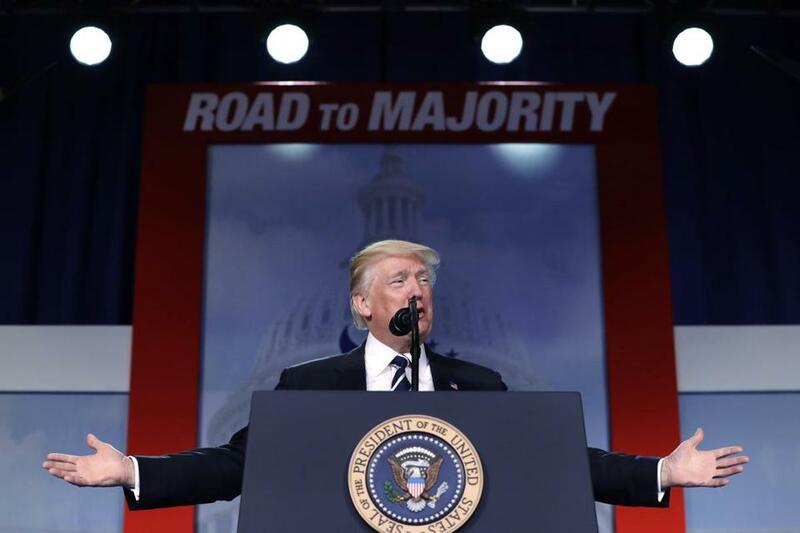 President Donald Trump spoke Thursday at the Faith and Freedom Coalition’s annual conference. Trump spoke Thursday at the Faith and Freedom Coalition’s annual conference at the same time as former FBI Director James Comey’s was testifying before Congress. The president did not make specific reference to Comey, who says Trump tried to get him to pledge loyalty and drop an investigation into potential collusion with Russia by his campaign aides. But in the first moments of Trump’s his speech he said ‘‘as you know, we’re under siege’’ and then vowed to survive and thrive. Trump also said on Thursday that congressional Democrats are ‘‘obstructionists’’ who are stalling his agenda. Trump urged the audience to help send more Republicans to Congress in next year’s elections. He noted that Republicans have just a two-vote edge in the Senate, where the rules give minority Democrats power to block or stall action on legislation. Trump also reiterated his commitment to repeal and replace the Obama health care law. The Republican-controlled House recently passed a bill with only GOP votes. The Senate is working on its own version. Trump spoke as fired FBI Director James Comey testified before the Senate intelligence committee.